CopyTrans Doctor is an all-in-one iPod repair solution. CopyTrans Doctor is able to correct iPod hard drive errors, establish iPod database (library) diagnostics, look for iPod missing lost or unlisted songs and even recover iPod songs you may have inadvertently removed from your iPod disk! CopyTrans Doctor fixes these iPod problems, gets your iPod back to normality and can even undelete files you have erased from your iPod. ...... it yourself from home? Sending your iPod to a repair service hardly costs less than $100 and generally means new parts and a complete iPod data deletion. 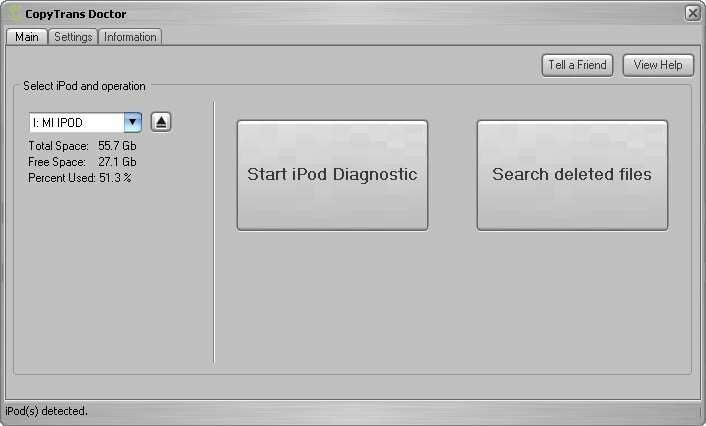 CopyTrans Doctor allows you to fix your iPod problems with just a few easy clicks and preserve your precious iPod data. Moreover, it looks for songs that still appear in your iPod menus, but cannot be played anymore. Inversely, it music that is still on your iPod, but not listed in its library anymore. Finally, CopyTrans Doctor allows to recover files you may have inadvertently deleted from your iPod. Qweas is providing links to CopyTrans Doctor 1.63 as a courtesy, and makes no representations regarding CopyTrans Doctor or any other applications or any information related thereto. Any questions, complaints or claims regarding this application CopyTrans Doctor 1.63 must be directed to the appropriate software vendor. You may click the publisher link of CopyTrans Doctor on the top of this page to get more details about the vendor.